Display Supply Chain Consultants (DSCC) is pleased to announce the launch of its Quarterly Smartphone Display Cost and Forecast Report. The report combines the robust and intuitive structure of DSCC’s cost model with insight generated by DSCC analysts to provide a comprehensive understanding of cost drivers in the critical smartphone panel application. A sample chart from the report is shown in Figure 1, showing the impact of low OLED fab utilization driving fixed costs higher in the first half of 2018, against the overall trend of declining costs driven by lower material costs and improving yield. Figure 1 demonstrates the detailed breakdown of the cost elements available in the report, including yielded materials costs for array materials, OLED materials, encapsulation, module components, touch panel and cover glass. Furthermore, by including the panel price for both history and DSCC’s forecast, the operating margin related to each product can be seen. The Smartphone Display Cost Report leverages analysis and insight gained in the DSCC Quarterly OLED Supply/Demand and Capital Spending Report, which allows a complete perspective on the capital costs for all areas of the OLED production line, the critical factor for understanding depreciation costs. The DSCC/OLED-A OLED Material Cost Report generates a detailed picture of material costs for the OLED stack, with additional modules for substrates (both flexible and rigid) and polarizers. The DSCC Display Supply Chain Financial Health Report covers the financial performance of panel makers, which is used to triangulate DSCC’s cost estimates with publicly reported revenues and earnings figures. Thus the Smartphone Display Cost Report, like its sibling report on TV, synthesizes insights across a wide gamut of DSCC activity to build a perspective on cost. 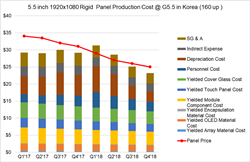 Subscribers to the report will be able to examine the detailed assumptions underlying the cost model, including distinct and independent estimates of yield by major process, including array, OLED deposition, encapsulation, module assembly, touch panel, and cover glass. The report includes comparison across products with varying screen size, resolution, Gen size for manufacturing, and location. Figure 2 shows an abbreviated chart of cost by product for Korea production in 2018, with some representative products. Costs for flexible displays are substantially higher than rigid displays, and a prominent driver of this higher cost is the lower yield for flexible panels in several process steps, which combined with higher capital costs pushes depreciation costs higher. In this Q1’18 edition of the smartphone display cost report, DSCC covers the range of existing and near-term products on the market. As new and more complex form factors emerge, such as foldable and/or rollable displays for smartphones, these variations will be added as well. An additional optional module of the report will cover larger displays for IT applications, including rigid table panels from 9.7” to 12.9” and notebook panels in 13.3” and 15.6” up to UHD resolution. For more information on DSCC’s Quarterly Smartphone Display Cost Report or to subscribe, please contact Dustin(at)displaysupplychain.com. Display Supply Chain Consultants (DSCC) was formed by experienced display market analysts from throughout the display supply chain and delivers valuable insights through consulting, syndicated reports and events. The company has offices in the US, China, Japan and Korea. DSCC can be found on the web at http://www.displaysupplychain.com and can be reached in the US at info(at)displaysupplychain.com or (512) 577-3672.